The Ricketts lab at the University of Vermont is seeking undergraduate applicants for summer research assistant positions in the lab. Motivated undergraduate students are encouraged to apply for the NSF-funded 10-week Research Experience for Undergraduates (REU) program, which runs from June 1-August 5, 2016. The deadline to apply is February 5, 2016. Pollination is a critical ecosystem service for Vermont crops that can be improved by conserving bees and other pollinators. To manage pollination well, we need information about the local and landscape factors that influence the activity, diversity and economic role of pollinators. We are researching how landscape factors and farm management practices affect pollination services from wild bee to blueberry farms in the Champlain basin. Students will join a team of faculty, postdocs, and graduate students at the UVM Rubenstein School of Environment and Natural resources. Successful applicants will have a strong interest in pollinators, botany, field biology, landscape or community ecology. Specific tasks will include field-based plant identification, bee observation/collection, and pollen limitation experiments. We expect that REU students will gain interdisciplinary knowledge in the areas of agroecology, landscape ecology, and natural resource management, as well as skills in plant/pollinator identification, specimen curation, and data analysis. This experience is expected to comprise fieldwork (70% time), laboratory work (20% time), and computer work (10% time). 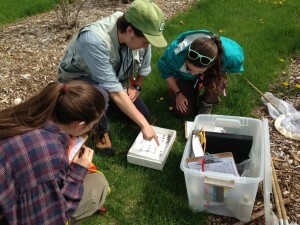 For more information, visit http://www.uvm.edu/~ecolab/?Page=REUprojects.html. The available position is listed under Project #13. Funded by the National Science Foundation, REU students will participate in an interdisciplinary cooperative model that promotes integrated thinking across disciplines within and between the natural and social sciences. Full-time undergraduate students with an anticipated graduation date after June 2016 are encouraged to apply, including high school seniors entering undergraduate study in 2016. Participants must be U.S. citizens or permanent residents and must be 18 years or older before May 31, 2016. Students from institutions with limited research opportunities and underrepresented groups are especially encouraged to apply.